I think the moms will love this easy, fun, biblical look at parenting for years to come! 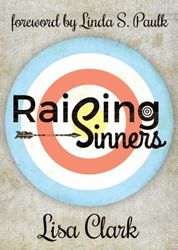 Lisa Clark’s new book, Raising Sinners, ($13.99, paperback, 9781498474078) is a book for moms (parents) in the midst of raising their children, who want a real, biblical, simple, fun and strategic look at parenting. She presents her thoughts as an "easy read" so moms could read it quickly, then read it over again. Topical and proactive, it's a guide for parents trying to raise their “little sinners” to love God with their whole heart, soul and mind – and serve those around them. This book has been 10 years in the making so it is proven effective, thorough and well written. It is perfect for moms who need confirmation that they are on the right track and for moms who need a few "nuggets" to get back on track. Lisa Clark’s parenting journey began over 26 years ago, but it wasn’t until she started teaching bible study at Prestonwood Baptist Church that the Lord told her “parenting” was her niche. God gave Lisa a word about biblical parenting, and so she started the process of teaching and encouraging moms throughout the Dallas area. This led her to partner with Sky Ranch Christian Camps in 2007 and the development of SkyMoms Ministry with her friend and Sky Ranch CEO, Linda Paulk. Lisa has a unique teaching style, which couples humor and personal stories of raising her own two daughters with biblical insights. She has spoken at countless women's events and retreats on this topic. Lisa has also been the president of her school board and served on several boards in different capacities. Xulon Press, a division of Salem Media Group, is the world’s largest Christian self-publisher, with more than 15,000 titles published to date. Retailers may order Raising Sinners through Ingram Book Company and/or Spring Arbor Book Distributors. The book is available online through xulonpress.com/bookstore, amazon.com, and barnesandnoble.com.